A couple of days ago I was in search of a recipe. I knew I had it somewhere, but I searched everywhere and couldn’t find it. Then I thought about the cookery books I keep down in the basement/office/general store, and ended up down there. I didn’t find it, but I did find something else: The Hamlyn All-Colour Cookbook from 1970. Oh yes! This was one of the first cookery books to have every single recipe illustrated, and illustrated in – drum roll, please – colour. Strange colour, in some cases, but colour. It was written by four people and the contributor of the first section is Mary Berry – in fact, it was her first foray into cookery books. Her part is largely devoted to baking and sweet recipes, and is predictably reliable, but I was looking for more savoury recipes. And I found them. Either the authors were under serious pressure (always possible), or these dishes were acceptable then, because some are – um – extreme. Many are extreme. I found myself in a strange land, serving to remind me just how far we have come, and just how far food styling has come too (the images are printed at so low a res that my shots will have to remain small, btw). 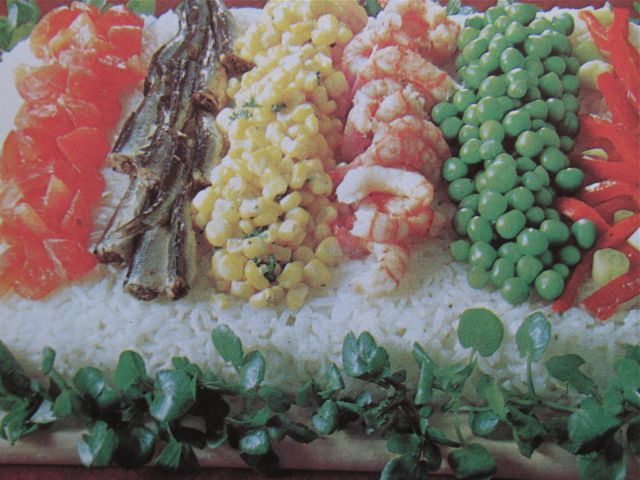 This is a rice salad, which consists of a large mound of cold rice with various uncooked ingredients placed on it in stripes, and surrounded by watercress. That’s it. Should you wish to host a retro dinner party, then I can sincerely recommend this book as it is, and not as it is in any ‘modernised’ version. It was a classic – almost every home had one – and it is perfectly, absolutely of its time. Think Abigail’s Party. Mind you, there might be a problem in sourcing some of the ingredients. Or not, even though they might be missing from your cupboards at present. The ‘lasagne pie’ for instance, uses a tin of minced beef or a tin of chunky steak (I think the stylist went for chunks), and that’s almost it. Half a packet of lasagne, the aforementioned meat, 1 tbsp tomato puree, some garlic salt and pepper, with single cream and grated cheese (not for a Béchamel – you just pour cream over it, cook it and scatter the cheese on top when it’s nearly done). Vegetarians, predictably, get few offerings. I spent ten years as a veggie – my family still are – and I well remember the Ubiquitous Omelette, now replaced (my brother tells me) with the equally ubiquitous mushroom risotto. This is the Vegetarian Sunburst Salad. 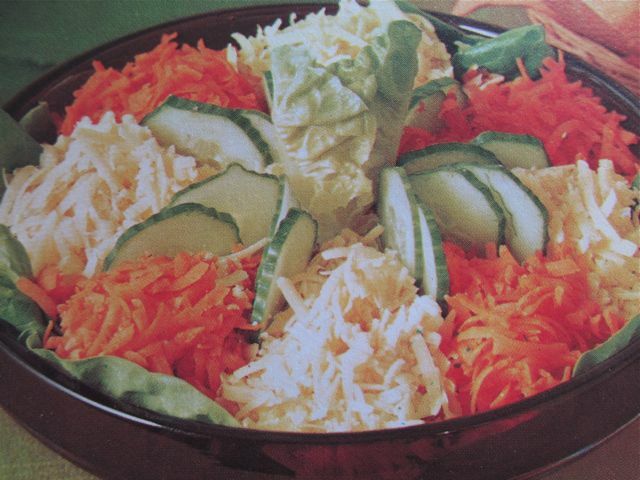 In case it’s not obvious, it’s grated carrot, grated cheese, some lettuce leaves and cucumber slices. It does look pretty, though… oh, and the dressing is peanut butter mixed with (bought) vinaigrette. I’d not realised the extent of the 1970 pineapple obsession. Fancy fried pineapple, with sausages and baked beans? No problems. 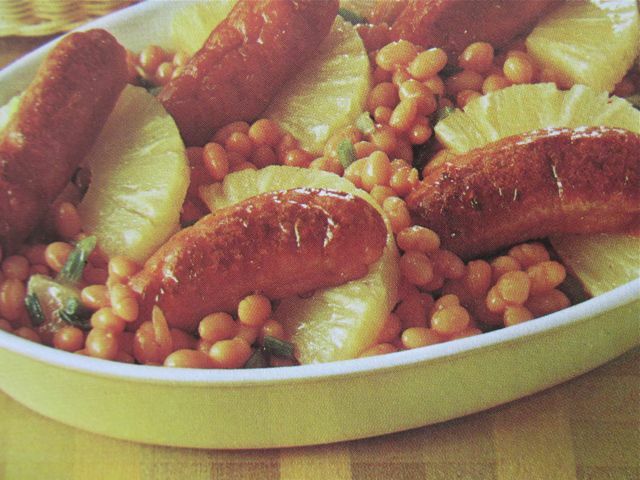 Try Sausage Beanfeast, with a bunch of spring onions, a can of pineapple rings, pork sausages and a large tin of baked beans in tomato sauce. You fry the onions and some chopped pineapple in butter, and add the beans and chopped grilled sausages (reserving some). While you’re doing this, you fry the remaining pineapple halves. Then you assemble as shown. But for me the prize goes to this dish. Now, my mother had this book. Plenty of friends had this book. I took an updated copy of this book to Uni. I’ve eaten some good things made from recipes in this book. I am not belittling this book. But I am – gobsmacked, I think is the right word – by Pineapple Crowns. These are Pineapple Crowns. I’m not quite sure what I was expecting when I read the recipe title as I flicked through, but it wasn’t this. Ingredients? 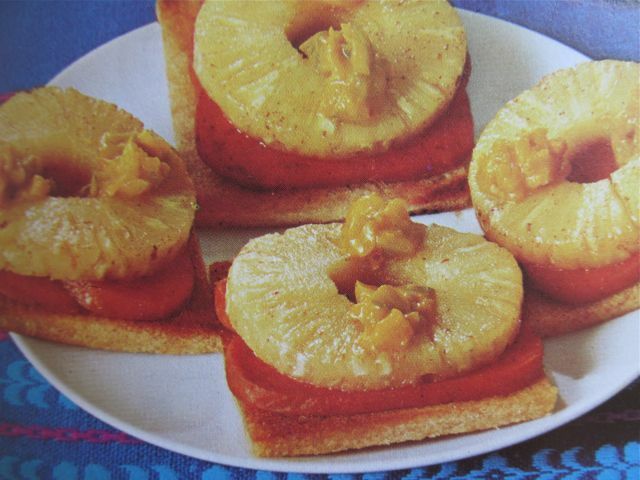 Mustard pickles, finely chopped; white bread with the crusts trimmed away; lard; slices of canned pork luncheon meat; another tin of pineapple slices (the mustard pickle is the stuff that looks like droppings on the top – thank heavens food styling has moved on). Basically it’s bread fried in lard, luncheon meat friend in lard, pineapple rings fried in lard, all piled on top of each other and topped with mustard pickle. Rather like a Noughties’ chef might produce a tower, though I don’t think lard would feature quite so prominently… just saying. Some of the sections are a little random, leading to some alarming juxtapositions: Cheesy Buttered Noodles (they look like tagliatelle, with butter and grated cheddar, then baked) next to Butterfly Layer Cake, which is topped with a can – well, with the contents, dur – of blackcurrant pie filling. They’re both in ‘rice and pasta’ by the way – ‘continental favourites’ has a frankfurter salad next to crèmes au chocolat – but there are more elsewhere. For me, this is the opposite of appetizing: it makes me feel slightly ill, and that’s without eating Pineapple Crowns. But I am so glad I found this book – if you see the 1970 version in a charity shop, do buy it. It won’t break the bank (mine cost me £1.50), and it may bring benefits. Remember the Rum Truffle? I don’t think I’ve eaten one since about 1987, but I did love them and there’s a recipe here and I’m going for it. I recognized this photo instantly with that cross crossing. My mum had one. I don’t recall using many of the recipes but I think she still has it. I used to look at the pictures for hours. Wasn’t there a chocolate pasta shell pudding in it. When I made it as a teenager no one could eat it as it reminded them of slugs! O M G. Hang on, just getting the book out. Cherry Ginger Crunch, involving a can of evaporated milk and another of cherry pie filling? Nope. AGH! 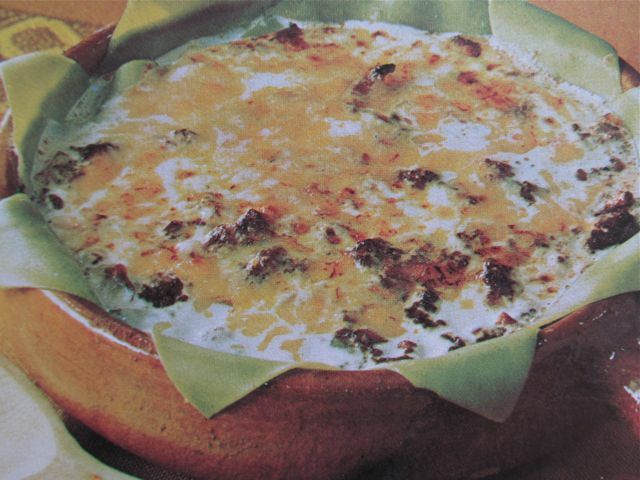 Not chocolate, but there’s an ‘Apple Macaroni Pudding’ where you cook the macaroni with butter and brown sugar, sling it in a dish, empty a can of apple purée over the top, sprinkle brown sugar over it, put a line of apple slices down the middle to disguise the dish of chopped intestines that you have just created, then bake. How the hell did anyone survive the 1970s? 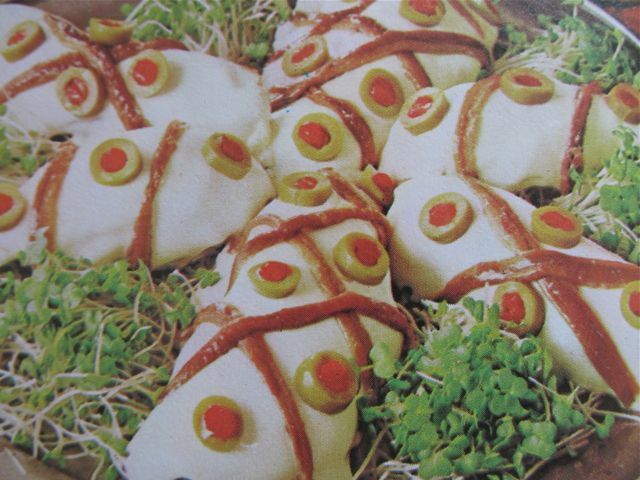 That means there’s another book of similarly scary recipe ideas in my youth! Oh but guess what? Just been home and found our copy. It’s there! Cleverly hidden in the pasta and rice section. Chocolate shell pudding! I didn’t imagine it! Now thinking of doing a tribute to it by trying all the veggie recipes! I’ve just thought… you know that ‘Julie and Julia’ film / blog, where the blogger cooked her way through all of Julia Child’s recipes in a year? We could do– no, we couldn’t. Eat that much lard / spam / condensed milk, and we’d die. Good point but i was thinking of revamping them as veggie/healthy recipes! Could be funny! I had that book. I have no idea where it is now but I remember the last picture – it always made me feel a bit sick – it reminded me of dead white mice. Sorry. No wonder I am a veggie. I’m with you, it’s disgusting. I didn’t quite get there when I was looking at it, but it always reminded me of something dead / out of a horror movie (‘I say, it’s, it’s… alive! ), I just couldn’t make up my mind what exactly.